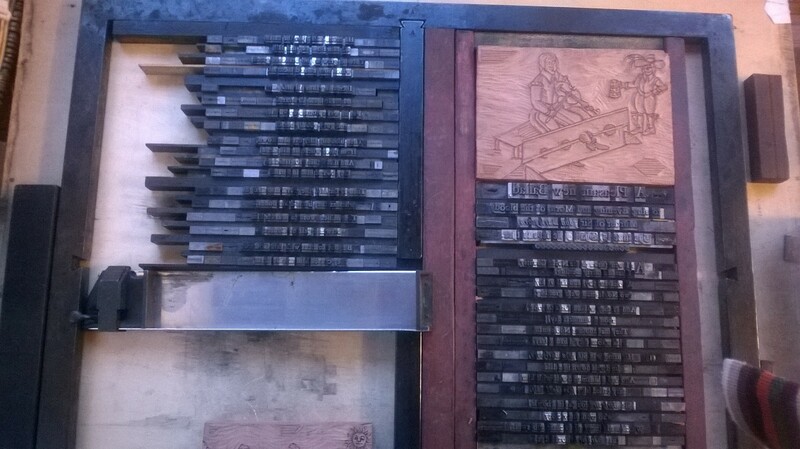 Ahead of this weekend’s event at Forty Hall, I’ve been toiling to get my new forme ready in time. Like a huge piece of overdue homework, it’s been on my mind each evening as I travelled home from work. Still, once I got into the workshop, I was soon lost in the task. Al’s help was invaluable as he sawed dozens of bits of furniture to size – furniture being the little pieces of wood that separate the lines of type. Getting each line tightly packed into the chase was crucial. Then came the acid test – once the quoins had been inserted and expanded, we very slightly and gingerly lifted up the frame, to see where the letters were still loose. We found some errors 3 or 4 times- then we had to loosen off, squeeze in another tiny spacer or even a sliver of card, and try again. Finally, the moment when we lifted the forme and nothing moved… “by George – I think we’ve got it!” Thank goodness. Now we can go to bed. All we have to do now is transfer the forme, together with the press and all the other gear, into the van and over to Enfield for the show! A painful process, but my hope is that we can use this same chase for the other four events this year. It’s suitably rustic; a shortened version of the traditional ballad “Sir John Barleycorn”, made known in the 1970s by the rock band Traffic, but actually dating back many centuries. Some say it’s an allegory of the annual killing of the corn god from prehistoric times…others may feel it’s simply a humorous account of the ale brewing process. Don’t look to this ballad for a how-to-make-your-own-beer instruction sheet, mind….constrained by space and running out of the letter “H”, I was obliged to take some verses out, but I hope the narrative still makes sense. Great work, I thought that song was by Airport Convention?? The 1970’s are a blur to me……………..